How to introduce a second shiba to your pack? YAY! I just got a phone call to confirm that we're getting a second Shiba!!!!!!!!!!! I am so happy and can't wait to share this great news to everyone. Saku's going to have a sister! Many questions running through my mind and any help from experienced shiba owner or people who have two shiba, please share your ideas! 1. How do I properly introduce a second shiba to her new home and to our existing shiba? I learn that I should introduce them in a neutral ground e.g a park and supervise their play and interaction. But how about meal time? should I feed them separately? should I let them sleep in the same room in different crates? how do I assure the new dog is comfortable and not feeling stress from the presence of another dog and how do I make sure Saku is not jealous of another dog? Should I slowly introduce the new dog to the entire house so she learns to respect our rules? Sorry for many questions, but I never have two dogs before. 2. The new dog is going to come in the airplane. Does anyone have any experience shipping a dog via air? Animal Rescue Flight or Pilot N paws? A little background about my current dog Saku. Saku is 8 month old (male/red). He is very friendly to people even more friendly to strangers to the point I feel he has the urge to please everyone (don't know where he got that from). He has never shown any aggression or dominance to other dogs before (in dog park and in obedient class). Most of time, he just wants to play with another dog; hence, I think it's great to have another dog. According to the new dog's owner, the new shiba is 9 month old (female/red sesame). Her human describes her as very friendly to people and to all dogs. 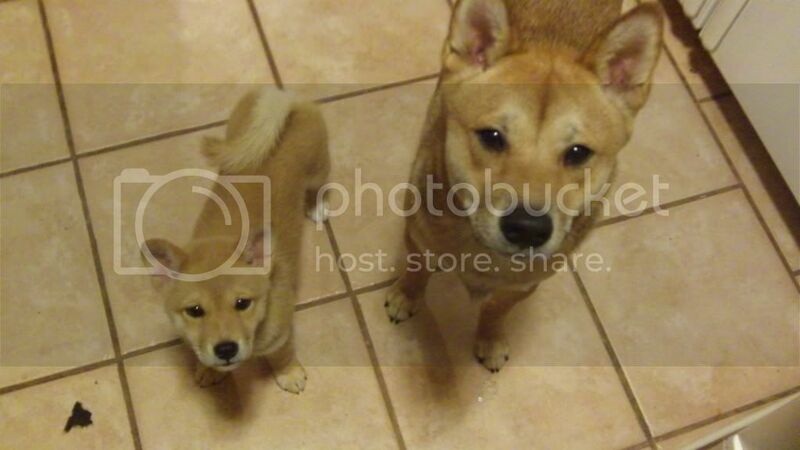 They have to adopt her out because their current shiba (4 yr/male) is not accepting her. Meeting in Neutral area is good also take them a walk together so when they get home they're not full of energy coarse don't walk too much if it's hot out. Take up all toys just in case so the dogs can settle in with no issues. Feeding seperate is good that way the other doesn't have to worry about one getting their food and they eat in peace. Few other things to say, but I dunno..
Saku I only have a moment, but you are so on the right track researching how to add a second Shiba. Trust me, I naively thought because they met outdoors at the breeders and got along fine they would be compatible. A week later I brought the new guy home and Scout viciously attacked him. A long story short it was months of living hell, but with the help of a trainer and behaviorist things improved dramatically and I leave them alone all the time now. Google the topic and I'm sure you will find many good tips, as it certainly can and obviously has been done safely and in a manner that gives them the best chance to become friends. Good luck. Saku, I'm in the same boat as you are! Currently researching and hoping to adopt a 2nd shiba!!!! Know your existing dog's personalities and make your best estimate as to whether he or she will enjoy a housemate. Remember your dog does not get to choose his or her siblings, you make that decision for him and you should keep his best interests in mind. introduction is important as a good start will make a smooth transition into your home more likely. You already know about the meeting on neutral ground. Remove all toys and food/chew toys off the floor and make sure you have both on leash on when you enter your house. You can take the new dog on leash around the house, so she gets to sniff and feels more comfortable. Do not trust them alone when you are not around or when you can't supervise interactions. Don't feel content that just because they seem to be fine and are playing together that things will just work out. Be cautious as you don't want bad interactions that can sour the long term prospect of them living peaceful together and the chance of them really enjoying each other's company. This takes time as you get to know more about your new dog and how the two behave around each other. It's better be safe than sorry. Treat the new dog like a puppy, meaning you don't assume she is house-trained or won't chew on things. Trust has to be earned. And definitely feed separately initially. As you know more about their interactions, you may change the feeding arrangements later. When precaution and management is carefully exercised, you will ensure the best possible chance of your two dogs getting along. Everything pays off when you see how they enjoy each other's company and play together. It still gives me lots of joy to see my two dogs play with each other! I knew from observing my boy INU playing with other dogs and his sweetheart temperment that I could bring another dog into the family. INU had just turned 1 and I was lucky enough to rehome Penny. Penny was just 9 weeks old and needed to be rehomed because the other dog there would not accept her. INU's reaction was WOW and as someone said to me yesterday at the dog park. Do you dogs play like this at home? (They were doing the Shiba 500) I said , "Yes all the time." She remarked, "Your so lucky." My main concern for you is resolving potential conflicts. You know your dog and the girl will be an unknown. Just be aware of the cues that might elicit conflict and have treats ready for reinforcing correct behaviors. The new girl might be a bit confused and react to her new friend as being the dog that would not accept her. My advice is to observe and intervene where necessary. Hopefully you will be as lucky as I am with 2 well adjusted (lol) Shiba. The following picture was taken about 15 minutes after they met for the first time. That picture is SO CUTE!!! Thanks for your advice sandrat888! I didn't think about it before, but it makes COMPLETE sense to treat the new dog as a puppy... TRUST HAS TO BE EARNED. Very well put! This will help a lot!! OMG I LOVE THOSE SHIBAS!! Hope it works out well! I would love to add another shiba someday but don't think Lola would approve so she'll have to remain an only "child"
One more thing. When adding a second dog, you also need to consider age and health issues. I got my girl Maluko first (She was almost 4 years old then and now 5 1/2 years old) and then I got goofy boy Koji (9 months old then, 16 months now). Koji was returned to the breeder and had to be rehomed because of no fault of his own. His previous owner's older dog had hip and knee surgery and did not enjoy a 9 month old rambunctious puppy constantly wanting to play. They decided to rehome him because the older female dog started attacking him. They were heart-broken because there was a mismatch in energy and health conditions. This is how I got Koji. Just want to remind everyone to take age/energy level and health conditions into considerations, along with dog's personalities. Koji is much more energetic and playful than Maluko, but Maluko being a mellow/zen-like dog herself, I know the chances of them tolerating each other is higher. She may not be the most exciting playmate Koji wants, but they do learn to enjoy each other's company now. Maluko is more outgoing and playful since I got Koji while Koji is a lot more calmer for a young boy. Having them together means they oth sort of coming to the middle ground and I got 2 well-behaved dogs with very different personalities that I really enjoy living with. Yes, DEFINITELY taking age, energy and health conditions into consideration! My Etsuko is 2 years old, very energetic and playful. Loves to do tricks, play around the house and go for long walks adventures!!! The Shiba I'm looking to adopt is 3 years old, only knows a few tricks... I'm not sure about her energy level or any health conditions, which is why I'm going to meet with her tomorrow!! @ Mattz- It's great we're both having a second shiba around the same time!!! let us know of how your meeting goes with her tomorrow! I didn't have the chance to meet the new dog before I decide to adopt her because she lives too far away from us (18 hrs drive). That's why I am a little anxious and concerned about how two dogs will react with each other when they finally meet. I will update everyone soon! @ Sandrat888 - thanks for the advice about "trust needs to be earned". When Saku first came to live with us, we confined him in a gated area for two weeks and then slowly introduced him to the rest of house after he showed us he can be trusted. He has been very respectful since and haven't chewed up or destroyed a single thing that doesn't belong to him in the house. With our new dog, should I do the same? I have to admit, I feel a bit uneasy to confine her while Saku gets to roam free in the house....I don't want her to feel unwelcomed given that she just left her home...But confining seems a good way to house break a dog and teach dogs boundaries and rules.. When I first got Koji, I crated him in my bedroom when I was gone and I closed the door. This way, Maluko did not get to tease him with her roaming free right in front of him. This is the safest way to ensure they did not have unsupervised interaction that could go sour and reduced the chance of the new dog making mistakes (peep or poop inside the house or chew on things). It took a while before Koji earned my trust and had access to part of the house and then eventually the whole house just like Maluko. If the new dog is not crate trained, you definitely need to do some training, so the dog feels comfortable in the crate. Sounds good to me... Though I immediately want the dogs to be just perfect together, I know it won't happen that way. It will take a lot of hard work, patience and determination from both the shibas and myself. I'm going to meet her today, wish me luck!!! Oh and her name is Cherry! Cute name I love it good luck on meeting. Thanks!! I met her on Friday and it went SO WELL! Upon first meeting with Cherry there was NO barking and NO hesitation. She came right up to me, let me pet her and even licked me! Great sign so far, as my Etsuko is the COMPLETE opposite. She barks at strangers and upon meeting strangers, she stands behind me the length of her leash. I was hoping Cherry would help Etsuko with her shyness towards strangers and I think she will! Cherry was recently spayed, had all of her shots updated and is 100% healthy as of one week ago! One concern though, will her recent spaying affect her temperament or attitude in any way? Cherry was absolutely the CUTEST thing! She's the runt of her batch, so she's about half the size of Etsuko. She likes to walk and play with other dogs!! I can tell she will have a great time in our household! She also does this cute little way of just plopping down wherever she wants, it's great! Next step is a meeting between Cherry and Etsuko this Saturday! If the both of them get along well, I plan on adopting Cherry within the next 2 weeks... Hopefully it all works out! Saku thank you for asking this question and everyone else for responding. We got a phone call today and Toby will be getting a sister if all goes well. Toby loves when other dogs come over and thrives when around them. With his age (11) I was worried about finding him a friend that would be a good match but we found someone that needed a home for a 9yr old shiba and was having problems getting her one because of her age. We are doing a meet up at a park this weekend and see how the two do then give it a few days and try having her over for a few day slumber party (our local humane societies require these but I think its not a horrible idea) and if all goes well Toby will have a sister! We are planning on feeding in different rooms mostly because Toby will only eat at night when everyone is asleep unless he is at my mom's then he her dog's food (its the same exact kind). Toby only eats Cheese and meat as treats, he won't eat dog bones other than greenies. The new dog eats dog bones as treats would it be ok to treat them together if they are getting different kinds of treats or just treat with the same thing? Also as for sleeping neither dog is used to being crated Toby sleeps in my room with the door closed and I was thinking of putting her in my sons' room with the door shut and maybe putting up a baby gate in the hall between the two rooms would that work? Due to their ages I do not want to stress them out more in a possible stressful time by forcing either of them into a crate. (The whole time Toby is crated he tremors and if he does fall asleep he has nightmares screams and runs in his sleep that's why he has not been kenneled after we had him for 2 weeks) They won't be left alone together for a few weeks so I don't have to worry about separating them for that. Thank you for any answers or suggestions. Hope all worked out mattz and Saku! Baby gates saved my sanity! I highly suggest segmenting your living space as much as possible while they are adjusting. It saves a lot of conflict while allowing them to be comfortable and observe the other. You'll see that they may even want to interact more - that they look forward to not being separated. I always leave them wanting more of a good thing when they're adjusting. @inubaka - thanks for the tips! We have baby gate set up already! So how long were they separated until you feel comfortable enough to remove the gate? That's GREAT to hear that you're (possibly) getting a second shiba!! Congrats! Cherry is about 1 week away from coming home with us, so excited!!! As for treats and food, I plan on feeding them and treating them separately from the get go no matter what. I don't want to bring food aggression into my household whatsoever, so I'll be taking it REALLY slow while introducing these two shibas to each other more and more. As for sleeping, it makes sense to keep them separated! I feel that during the first few months all interaction between the two shibas should be supervised, so I would advise to have them sleep separately as you will be unable to supervise them. But hey, I'm in the same boat as you - I'm new to getting a second shiba! The aforementioned are just my plans for my particular situation... Best of luck to you! "So how long were they separated until you feel comfortable enough to remove the gate?" As long as you think they need. I know its a vague answer but its true. We've had fosters that we could integrate in a week, and some that took months. So, it really depends! Take time to get the know the new dog's body language and behaviors almost as well as you know your dog's - thats when I feel safe to remove some barriers and let them interact freely. My foster dog is coming soon. I was told to give him time to adjust to the house before introducing him to my current dog. If I get a good vibe from him is it okay to have them meet the same day? My current dog is afraid to go outside so they won't be able to meet in a neutral place... it would be inside the house. zoe - cna you set up a "foster" area with a gate or something? they can certainly sniff one another through a gate right away and over time you can see if they get excited in a good way about one another and allow for shared walks or short play time. It really depends on the dogs, zoe. When Juliet was a "foster" (I say this loosely since I now know they were hoping we'd adopt her all along! ), we did a meet and greet with her and Hamlet on the first day, both in a neutral zone and back home. As I've said before, Hamlet's very dog-friendly and confident, and Juliet, who was timid at the time, fed off of his confidence and enjoyed playing with him. Hamlet mellowed out so much in the first few days when he had another dog to share his home with...he's really a "multi-dog" kind of pet. It was probably a match made in heaven since I know alot of people have to do multi-introductions and keep dogs separated for the first few days. You really just have to know your pets and read the foster well. Hi everyone, I know this thread is kind of old but I figured After surfing around on the forum this one was okay. So we decided to foster a shiba from a puppy mill in Arkansas. It was pretty short notice, some of you might be aware of the situation. It is through SIRA, and it was a commercial breeder that is downsizing and was giving 19 shibas to SIRA. SIRAwas unable to find enough foster homes so my boyfriend and I (after receiving 3 emails saying they desperately needed help) decided we should give it a shot. We picked up our foster, Ellie (8mo) on Sunday night. She came home and we did what everyone on here has suggested. We introduced Ellie to Lady on neutral ground, walked them and then brought them up stairs to out apartment. We removed all Lady's toys, and put away all food. We attempted to walk Ellie into the apartment and Lady began to demonstrate some territorial aggression (growling, posturing, etc). So we put Ellie in the kitchen behind a baby gate so we could try and feed/water her. We put her crate in the kitchen as well. After that we all went to bed in out bedroom, Each dog in crates. Monday we went on multiple walks and the day went the same, Ellie seperated from Lady via crate or baby gate while in our home. There was some aggression towards Ellie in the beginning of the day, bu as the day wore on Lady began to leave her alone. In the evening however, Ellie began to bark incessantly at Lady. Any time Lady is in Ellie's vision Ellie becomes agitated and anxious and begins to bark, rattles her crate, or charges the baby gate. I have began covering half of her crate to calm her down, however it is negatively affecting Lady, causing her to be scared, and anxious. I know that it takes weeks for a relationship to form, however we are worried about our dog. An aside: when we interact with Ellie, she is so sweet to us, not timid, and ready to play. I just think that she was over whelmed with the barking from Lady on their first interaction and maybe became defensive? She approaches strangers on the street and other dogs when we are walking. I feel terrible crating her because I think she'd do great Ina home with dogs that are used to having multiple dogs....? Sorry for the long thread! We are just super confused, and don't want to make any mistakes or hurt our baby, or do any damage to the new dog!! Any advice on what to do next would be great! chicagoshiba262: Well sometimes things are unexpected in terms of behaviors. It is not uncommon for impatience, jealousy and frustration to rear its ugly head when a new dog enters the home. Behavior regression requires backing up on the training the dog knows. It sounds like your own Shiba is a bit frustrated. Is there a way to crate her in another room while you play and work with your new foster and is there another room that the foster can be in when you play and work with your own dog? Sometimes dogs just get overwhelmed and you have to get them in another area to calm down and learn to get a grip. Rotating dogs is probably the best bet to start. It is certainly good that you are noticing the behavior of the foster. The last thing you want is erosion of confidence. Prevention is not a cop out and a good training tool in regard to separation. If you are unsure what might happen in a particular situation it is best to manage it by avoiding dog to dog interactions together. What does you own dog know as far as training commands? It might be a good idea to have one person go through some training routines (on leash or behind baby gate) while you work with the other dog with view at a distance and see how that goes in sessions over several days. Targeting or NILF (Nothing in Life is Free) refresher. What training methods have you used to train your own dog? If you started with the clicker I would look at "click to calm" as far as establishing some self control or "control Unleashed". It might help to tire your own dog out as well before you work if she is high energy. Take is slowly, your dogs really has to get over the other dogs smell being in the same area first, let alone viewing the dog. From what you write it seems like it has been only three days or so. That is a very very short time. It can take weeks so go slowly by separating them from each other for right now. This means walking too if there is a lot of posturing. The last thing you want is continued erosion of the foster's confidence over time. In the duration maybe get your foster out on play dates etc to make sure that she remains comfortable around other dogs. Even a separate training class so she has some one on one time away from your own dog out of the home. If after a certain time your foster is still overwhelmed then it might be best to get her in another foster environment. Continual unresolved tension in the environment is very stressful to both animals and their cortisol levels. This is the best I can suggest for the time being without hands on view. Maybe a trainer can assist by coming over for a consult to give some tips based on her/his observations. @chicagoshiba262 I'm no expert, but it sounds like you guys are on the right track! When I introduced my Shiba's the new one was already 9 months old, so she had a little bit of her own attitude coming into our house. Our first few weeks was rough. They would play and be seemingly fine, then out of no where, for no apparent reason (to us) they would start fighting. We would seperate them in their time out spots and start all over; the fighting went on about 2-3 times a week for the first month or so. After a year, they are still not best friends, but more like siblings (both female, so I think there is still some competition there) Shiba protects Lyla, and Lyla doesn't like to walk outside without her big protective sister. Moral of my story is, I think you just need to keep at it! I am bumping this old thread because I recently got a new puppy. Not a Shiba this time but a Podengo. I knew it would take some time for Juni to adjust, because of her personality, it takes time for her to get to know and trust other dogs and is quite territorial. We brought him home on the 22nd of Dec and the first few days she couldn't even look at him without scream or growl, bark and sometimes charge at him. So we keep them separated of course. He gets a bit startled if she barks but doesn't seem afraid or anything. Outside they can walk together reasonably well (but of course he is so little so he walks a bit and then I carry him), she tells him off if he gets too close but not too harshly. Indoors she is fine with him nowadays if we carry him or have him on our laps and then she actually wants to sit close by too. But if he is too rowdy or runs straight towards her (with a fence inbetween) she gets upset and screams. She gets a lot of praise and treats when she keeps calm and I also move the puppy so he keeps a good distance to her. All in all I guess I see slow improvements. But I would love to get other shiba owners experiences. If you have an older dog who is not super friendly with other dogs, how did you introduce the new puppy? how long did it take for the older dog to relax around the little one?